Detailed below are Houseboats either moored permanently in Binga or houseboats that switch between Kariba and Binga. There is a limited selection of houseboats in Binga and the ones detailed here are the only ones available, other than privately owned boats. Binga is 300kms from Victoria Falls and 190kms from Hwange Main camp, sections of the road have potholes so it takes roughly 4hrs and 3hrs respectively but it's a pleasant drive through rural Zimbabwe. Self-drive is the easiest option but transfers or charter flights can be also arranged. 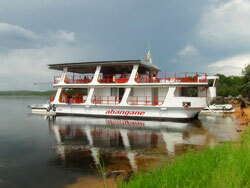 These Houseboats are ideally positioned if you are incorporating a holiday at Victoria Falls and Hwange National Park. Sometimes called the golden triangle, these three locations are all within easy driving distance of each other. 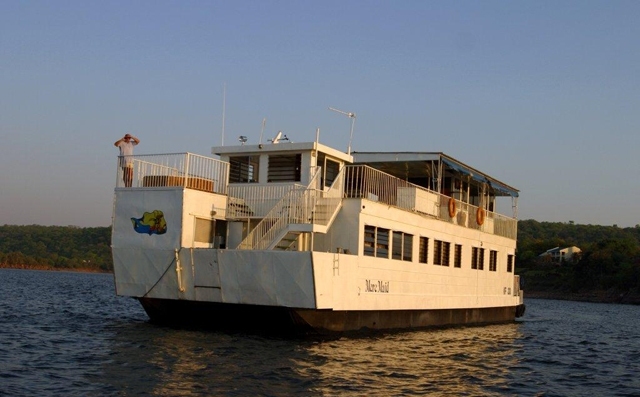 Together they include a natural wonder of the world, Victoria Falls, pristine big five game viewing in Hwange and ultimate relaxation, game viewing and good fishing aboard a lovely houseboat on Kariba. The game viewing around the Binga side of the lake is less productive than on the Kariba side which has the Matusadona National Park. However the fishing is good, the bird watching is excellent and some game will be seen. Journeys up to the Sengwe river and beyond offer complete peace and solitude and a totally relaxing holiday in the sun. You will see far fewer, if any houseboats at this end of the lake, which is an appealing advantage. Faster boats or longer days out means that you can easily get to the eastern basin around the Ume river and Matusadona National Park for prime game viewing. There is a bigger choice of boats on eastern side of the Lake (Kariba Town), but the snag is getting to that side from Victoria Falls, which involves either a long drive or a long and expensive charter flight. Alternatively, the Kariba Ferry is a pleasant option. The houseboats we have detailed below should cover all your requirements from economy to luxury and all group sizes, we have personally inspected all of them, enabling us to give honest reviews. 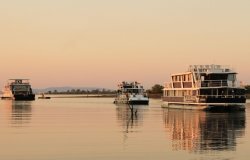 Click on the links below to look at these House boats in full detail and if you scroll further down you can read more about Kariba and having a houseboat holiday. The town of Kariba was originally developed for the construction workers on the Dam Wall. After the Dam filled and it started to become recognised a recreational playground, tourism flourished and hotels and lodges sprang up in and around town and along the lake shoreline. Today, these town hotels are used more by local Zimbabweans who have their own boats and come on holiday. International tourists generally stay at the more luxurious safari lodges detailed below, where there are more activities and they can enjoy a safari. Caribbea Bay Resort is probably the most popular hotel, followed by Cutty Sark Hotel. Hornbill Lodge is a boutique lodge with stunning views, whilst Nzou Lodge, Cerruti and Wild Heritage offers affordable self-catering accommodation. Warthogs Bush Camp has backpacker accommodation with a great relaxed atmosphere and location, while Lomagundi Lakeside also has self-catering and camping options. 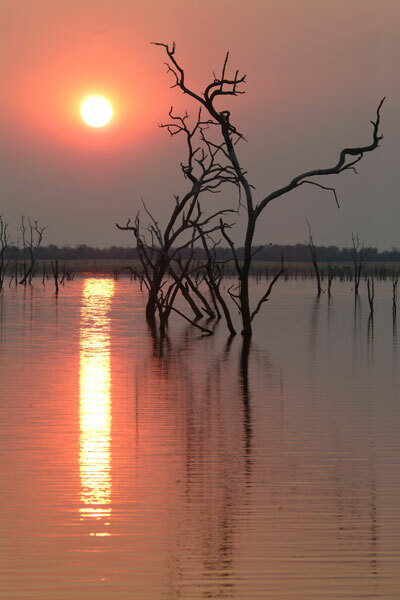 Lake Kariba is a very noteworthy safari destination, although mistakenly often overlooked by international tourists. The safari lodges that have developed on the islands and mainland along the Matusadona shoreline offer some truly amazing safari opportunities. The ones we recommend are Spurwing Island Lodge, Musango Island Camp, Bumi Hills, Changa Safari Camp and Rhino Safari Camp. Each one has its own uniqueness in some way, so please contact us for more information and details on each. This is going to be a very short paragraph as options are very limited indeed. This western end of the lake is remote, and tourism has never really taken off. It is very convenient if including Victoria Falls and Hwange in your holiday plans as it’s a nice drivable little circuit. There are a few houseboats at this end which are popular and the accommodation available is really for a night on either side of a houseboat trip. Masumu Lodge is top of the ranking here and is actually a very nice spot. Chilila Lodges also have a few nice chalets. 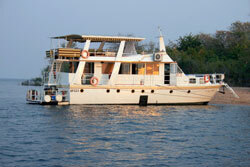 These both serve the Chilila harbour where several of the houseboats are moored and Zambezi Cruise Safaris depart from. Kulizwe Lodge serves the Kulizwe harbour, where the other houseboats are moored. Mlibizi is a bit further west and it is from here that the Kariba ferry starts and ends. Accommodation is limited to the basic Mlibizi resort, right by the ferry harbour. The once beautiful National Parks, Tashinga Campsite and chalets are today in a fairly dire state but are still open. Situated at the mouth of the Ume River in Matusadona National Park, access is very difficult and is either by boat or via a very arduous 4 x 4 road. Experienced 4x4 self-drivers attempt this, as the location is beautiful once you get there. • Upper deck bar, table and chairs, sunbathing. • Self catering rate US$ 600 (low season), US$ 700 (high season) per boat per day (max 10) - dry boat. • US$463 (Low season); US$663 (High season) per night up to 15 people; self catering excludes meals, drinks and fuel. This 5000 square km lake, which when built was the largest man made lake in the world is by far one of my most favourite places to go. 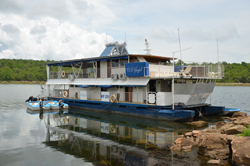 Over the years we have done many houseboat holidays and they are always great time for family and friends. The lake is 281 kms long and at its widest point is 40 kms wide. The lake is studded with islands and fringed with magnificent mountain ranges like the Matusadona mountains and the whole landscape is supremely beautiful. Sunrises and sunset are indescribably beautiful and the absolute magic of this place can only be understood by those who have visited it and fallen in love with it. The warm clear waters are home to over forty species of fish, the most notable of course being the tiger fish for which anglers come from around the world to catch. The lush shoreline vegetation supports a profusion of bird and wild life, which is ideal when cruising on your house boat or even on one of the smaller tender boats, as you explore the shoreline or the many channels and inlets. All in all if you are looking for a holiday of total relaxation, with the added attraction of game and bird viewing, some of the best fishing available, some of the most outstanding scenic and photographic opportunities....a Kariba House Boat holiday is ideal for you.. This is a tricky one as everyone is different, so I would rather give some information and let you make your choice. Kariba gets extremely hot during the months September through to March with temperatures often in excess of 40 degrees centigrade. October and November are particularly hot and dry before the rains arrive. The rainy season starts around the middle of November and finishes around the end of March. This can be a spectacular time, watching the huge thunder storms brewing over the vast lake, however if you are there when the inter tropical convergence zone arrives you will have a miserable time, as you can get 3 weeks of continuous rain with ease. During the cooler months of April to August the weather is beautiful. Warm days and cool nights. Beautiful blue skies, chances of rain are very slight..
Game viewing is pretty good all year round; but is best through the drier months August to November. Birdwatching is also phenomenal all year round; Summer migrants arrive normally around September time. Over Easter and Xmas and New Year houseboats are very popular and generally fully booked, so make sure you try to book at least six months in advance..
Two nights is absolute minimum but a week would be my recommendation. Gives you time to unwind completely and really get into the ambience of this idyllic place. These houseboats are all fully staffed with a Captain, chef and crew. Once on board the most you will have to do is lift your arm to drink your gin and tonic. You will completely unwind and relax. The houseboats all have tender boats with them included in the price. So once you are moored at your night spot, you can then take the smaller boats out for fishing or game viewing excursions. Its great!! Kariba House boat 's are all fully equipped with fridges, freezers, stoves, cutlery, crockery and linen, you just have to bring your clothes and personal effects. Of course if you decide to self cater, you will need to bring you own food and drinks. Please look at each individual boat to see what else is included. Don't forget Kariba is a Malaria area so please take the necessary precautions. If you have any other questions please don't hesitate to contact us, I am more than happy to answer any questions you may have.